When Janet De Neefe stepped off the plane in Bali in 1974, she felt an immediate connection to this island paradise. Though curious about Bali's culture, its warm people and its mouthwatering cuisine, she didn't expect to fall in love with a Balinese man and make a new life there. Now, years later, Janet and her husband have four children and run two of the most successful restaurants in Bali. 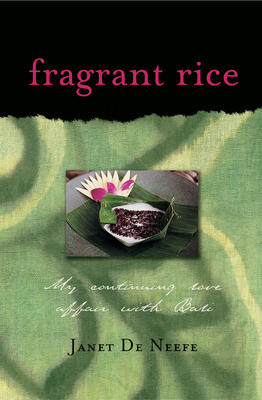 In this delightful memoir, Janet shares entertaining stories of being 'gently shaped like warm rice for offerings' as she adapts to another culture and way of life. She offers insights into the ancient myths and rituals still alive in Bali today and passes on delicious recipes handed down through generations of her husband's family. Fragrant Rice shows how the love, hope and warmth that makes this island such a special place is still very much alive today. Janet De Neefe earned a degree in Arts and Crafts at Burwood State College in Melbourne, before traveling to Bali where she met her husband. The owners of several restaurants and stores in Bali, De Neefe also runs classes on Balinese cooking, which are attended by visitors from all over the world.